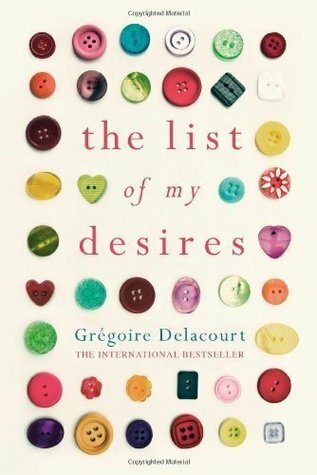 So, The List of My Desires, the ‘international bestselling sensation’ by French author Grégoire Delacourt, appealed to me a when I stumbled on it at the library. It had the added attraction of being translated by Anthea Bell, who is pre-eminent in her field. The novel is the story of a plump, placid haberdasher called Jocelyne who wins 18 million-odd euros from a chance entry in the lottery and is betrayed by her husband. Before the win, she is reasonably content with her ordinary life, and because of the dire warnings from lottery management about the pitfalls of such a large win, she chooses not to tell Jo, her husband, and hides the cheque in a shoe in her wardrobe. While she draws up lists of potential purchases with her windfall, her husband finds the cheque and disappears with it to buy the things he’s always wanted (posh car, expensive watch, a big TV etc). She grows bitter, loses weight, abandons her shop and her thriving craft blog, and mooches about feeling betrayed and melancholy until eventually she gets a cheque for the balance of 15 million-odd euros from her sadder-and-wiser husband and makes a new life for herself. The book concludes with her statement that she is loved, but that she herself no longer loves. I loved my thousands of Isoldes who read tengoldfingers. I loved their kindness, calm and powerful like a river flowing along, a regenerating force like a mother’s love. I loved that community of women, our vulnerabilities, our strengths. I loved my life deeply, but the moment that I won the lottery I knew that the money would wreck it all, and for what? Imagine having 18 million euros and not thinking of the good you could do with it! She plans to burn the cheque rather than do something useful with all that money… Sure, she does consider that she could do something for her children, and with her remaining 15 million at the end of the book she plans eventually to give one million of it to someone at random, but there’s no plan to endow a worthwhile fund or donate to charity in France or anywhere else. What would you have done if you were in Jocelyn’s shoes? If you had cashed the cheque, what would you have spent the money on? How would you describe Jocelyn’s relationship with her husband, Jo? Why is Jo unfulfilled by his new life as a millionaire? Louise at A Strong Belief in Wicker reviewed it too. I read it a few months ago and it was OK, I was probably more inspired by the cover than the content. I was left feeling very unsatisfied with the book – disappointing! Thanks for the link Lisa. I don’t really remember detail about this book, but see that I was a little more generous towards this book, although of course I still found many flaws. I am generally quite intrigued about modern French books, and keen to read books in translation, and French stories. It is disappointing when they don’t live up to expectations. I remember seeing his latest book in the shops recently, and I do believe rather incredibly for me that I left it on the shelf- normally I buy any French book in translation without thought and stick it on my overburdened French TBR shelf.